Last year, we were treated to the sophomore release from crunk rockers, Family Force 5. Their second offering, Dance or Die, was noticeably different than their debut, Business Up Front, Party In The Back. Although elements from Business... were still there, Dance or Die was - as the name implies - more dance than crunk. In 2009, as is popular with dance tunes, all of Dance or Die went through a vigorous remix process. Each track of the album was remixed by a different person or group. The track list remained in the same order as before, with a brand new track right tacked onto the end followed by two alternate remixes, making fourteen new tracks for the project titled Dance or Die With A Vengeance, remixed by people that you're probably familiar with, and some that you may never have heard of. At first, there were some names I had never heard of before. The Pragmatic did one of the remixes for "Rip It Up," giving it a nice new beat, and not changing much else except the addition of what sounds like a sample of a dialogue made to resemble having been lifted from an old movie about a man named Dr. Disco (expect some cheesiness here). "Fever" was remixed by The Toxic Avenger, who made it a little dancier than before (as well as a minute and a half longer, which is partially due to a series of skipping vocals that just ends up being completely annoying), but also made it a tiny bit off beat in the chorus. Another unfamiliar name was Andre Allen Anjos with "D-I-E 4 Y-O-U." What was originally entirely a rock track still sports some guitar near the end in this remix form, and the screaming still remains as well, but the rest has transformed into a fun and upbeat dance tune. Nice work from Mr. Anjos. The last unfamiliar name actually becomes very familiar upon listening. A second remix of "Rip It Up" is said to have been remixed by Croul-Glo-Activation. When you listen, you not only hear different music, but different lead vocals entirely: Crouton's. Soul Glow does make an appearance too, though, close to the end in an added rap bridge. A couple of the names of remixers were kinda worrisome as well, due to their reputations. The mainstream groups 3OH!3 and Cobra Starship are very popular for their catchy tunes, but also have their times where the lyrics aren't exactly family friendly. I thought that we could all trust FF5 to make sure that nothing of the sort was added to whatever tracks these two artists remixed, and thankfully that IS the case. Neither 3OH!3 nor Cobra Starship's Alex Suarez added anything profane to the mix. But even so, their remixes both have their disappointments. 3OH!3 took over the ultra-crunk "Get Your Back Off The Wall." It's not terrible, really, it just struggles to keep one's attention at the beginning and end, both of which just kind of drag on and bring the song down a little. Suarez has the first of the two remixes for "How In The World," and he turned it into a hyped-up, funky, almost-disco track (possibly sounding like something that could be in the background of a level from one of the original Sonic the Hedgehog games). The music is great, but odd for the song, as the original is a straight up electronic ballad. The only other real problem is that the vocals in the chorus are purposely held back a beat or two. They're still on beat, but it almost comes off as sloppy, and anyone who loves the original version may not enjoy it. The rest of the names are mostly recognizable if you're somewhat familiar with Family Force 5's touring history. Several years ago, FF5 went on a headlining tour called Dance Rawr Dance, which included an up-and-coming emotronic artist called The Secret Handshake. After appearing last year on a national release called Punk Goes Crunk, The Secret Handshake is getting more exposure with a remix of the title track, "Dance or Die." Anyone familiar The Secret Handshake's music will recognize Luis Dubuc's vocals at the beginning (and again about two-thirds into the song), as well as a taste of his style of dance and synth mixed in. 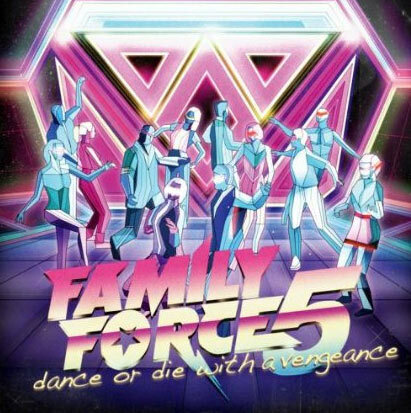 FF5's subsequent headlining tour (Dance Rawr Dance 2), featured a couple of relatively unknown (and not too impressive) artists, Ultraviolet Sound and Danger Radio, who appear on Dance or Die With A Vengeance with remixes of "Party Foul" and "Share It With Me," respectively. "Party Foul" screams for you to get out on the dance floor. A deep voice at the beginning says "Time to sweat, time to move, time to get in the groove" with a simply fantastic dance beat driving the entire song. It ends up being more of a sampling of the song, however, as only the chorus (and a line or two from one of the verses) is used. Though it definitely could have done without the "Check yourself before you wreck yourself" at the end, it's still a highlight. Danger Radio's take on "Share It With Me" is similar to the Cobra Starship remix in the sense that it's a ballad that's turned upbeat. It's much more poppy this time around, with some "oh oh"'s thrown in, along with some distortion on the vocals here and there. Surprisingly, these are some of the top remixes on the disc. There are even a few head-scratchers along the way. For instance, "The First Time" was remixed by Matt Thiessen from Relient K. A little weird as Relient K's style isn't exactly dance (or close to it at all), but Thiessen does give "The First Time" a nice makeover. The beginning is slightly off beat, and he added a little bit of humor when he adds the lines "Cold chillin' for the first time, thuggin' up for the first time, cold chillin' for the second time, make it rain for the first time." It kind of takes away from what is otherwise a pretty song. Then Lauren Olds takes the semi-rocky "Wake The Dead," drops the guitars, and gives it a pretty catchy beat, possibly improving on the original (which wasn't expected at all anywhere on the entire disc). A bigger surprise is the second remix of "How In The World," which was done by the David Crowder*Band. A praise & worship band by nature, which makes it odd, until you remember that they're more musically innovative than the typical praise & worship group. Their rendition is closer to the original than Suarez's, but not so close that it's just a carbon copy. It's a little more upbeat, and decidedly more dancey. But while Relient K and David Crowder*Band may be a little surprising, I don't think either of them are more surprising than Jasen Rausch from modern rock band Red. Rausch remixed what made for a highlight on Dance or Die, "Radiator." It's different than the original, but out of all the remixes here, this one may be the closest to the original. There's some nice synth in the beginning, and some added guitar at times which sounds nice. The only problem is the way he made the snare drum sound throughout almost the whole track. As mentioned earlier, the Family not only present some remix tracks, but they also went and created an entirely new song for us. "Ghostride The Whip" is nothing but a straight up gangsta jam, VERY closely resembling something you might hear on a Pettidee (or 3 The God Way) album. At first, you almost wouldn't believe that it was Soul Glow and Crouton on vocals, but once you listen more, you can decipher it enough to recognize them. Don't expect anything spiritual (it's mainly just about cruising), but expect an amazing beat and some dirty south vocals. Normally, when you hear a song like this (and every song from the artist is about the same thing), the artist can easily be dismissed as talentless. But given that that isn't the topic in every FF5 song (they just like to have fun every once in a while), "Ghostride The Whip" doesn't end up being a waste of time. Dance or Die With A Vengeance has its ups and its downs. There are some incredible beats throughout (with great sound quality and production), along with some tracks that fulfill their intentions by making you want to dance (followed by getting yourself up and actually dancing). But some of the remixes are hard to get into once you're already familiar with the original version. If you have an attachment to a particular song (or songs), hearing someone mess with them is a big deal and its hard to enjoy the new take on them. It may be different, but the more you listen, the more you start to enjoy it, and you start realizing that all the remixes are good in their own right. Being different isn't what affects the overall quality of the project. And for the most part, each artist did a really good job with their respective song. It definitely won't win back any of the fans that were disappointed at Dance or Die's style change, but it's definitely a recommendation for real fans of the band and not just the casual Family Force 5 listener.